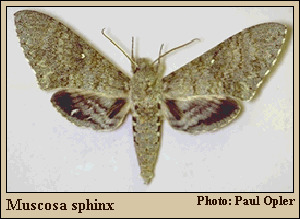 Identification: Upperside is soft greenish gray; forewing has a small green to white cell spot, hindwing has black bands and a black patch at the base. Wing Span: 4 - 5 inches (10 - 12.6 cm). Flight: . One flight from mid-July to early August in southern Arizona. Caterpillar Hosts: Unknown; perhaps plants from the families Solanaceae, Verbenaceae, and Bignoniaceae. Adult Food: Nectar from deep-throated flowers. Habitat: Tropical and subtropical lowlands and premontane forests. Oak woodland. Range: Costa Rica north through Mexico to southern and western Arizona.